Was born in 2000, in Cherepovets, Vologda Region. Graduate in the Cherepovets Regional College of Arts and Crafts named after Vereshchagin (class of Jaroslava Burovtseva). He is studying at the Municipal Budgetary General Education Institution "Educational Center No.11" in Cherepovets at the same teacher class. 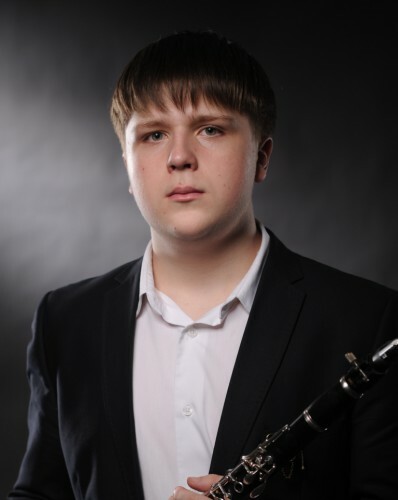 Winner of the International Competition of Musical and Choreographic Art "Lace Talent" (Vologda, 2015), Russia-wide Stolyarov Festival "Sounding World of Childhood" (Cherepovets, 2015), Moscow Open Festival-Contest of Young Performers on wind and percussion instruments named Dolzhikov (2016). II Prize Winner at the International Youth Competition of Classic Solo Performance «Nota bene!» (St. Petersburg, 2016). Participant of master classes by Vladimir Lovchikov and Anton Prishchepa. He performs in Russia and abroad.